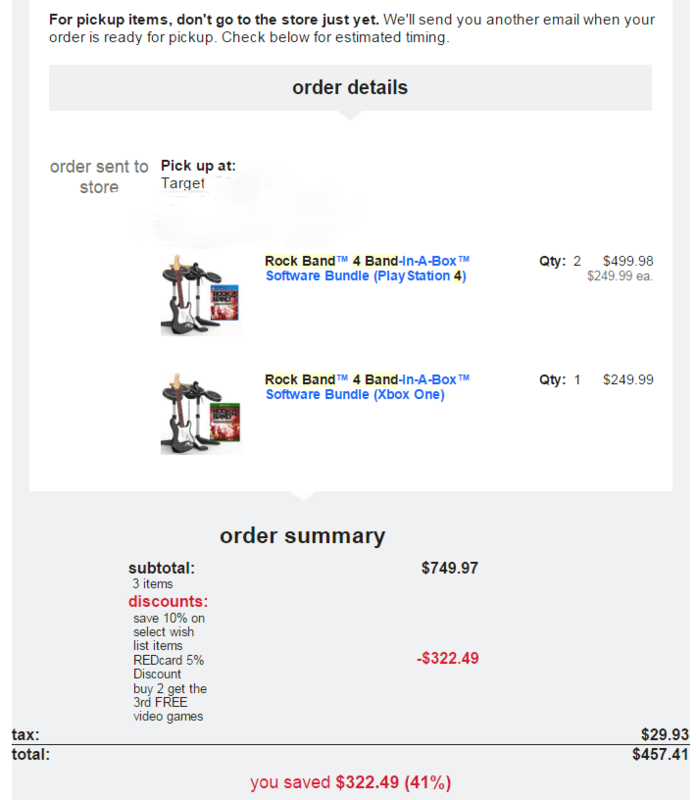 Rock Band 4 Band-in-a-Box was selling for $250 at Target, but they were doing a buy 2 get 1 free sale on videogames, and the Rock Band 4 bundles were part of the promotion. I bought 3 bundles, stacked a few coupon codes and my Target card, and my total bill was $457.41. I kept one bundle for myself and sold the other two bundles at a local used game shop for $200 each. The shop owner was happy to buy them for less than retail, and I was more than happy to only end up paying $57.41 for a copy of Rock Band 4 with a set of drums, a guitar, and a mic. You can also return the spare bundles to Target and they will divide the discount up evenly, but why do that if you can make a little extra quick and easily? I saved $322.49 by stacking promotion codes with my “Red Card” during a “buy 2 get 1 free” promotion at Target. DualShock 4 PlayStation 4 controllers normally sell for $50, but I was able to pick up a Glacier White version of the controller for only $30 from a site called Jet.com and using a $20 off promotion code “NEWTOJET”. This deal might still be active, but you need to be a new customer. 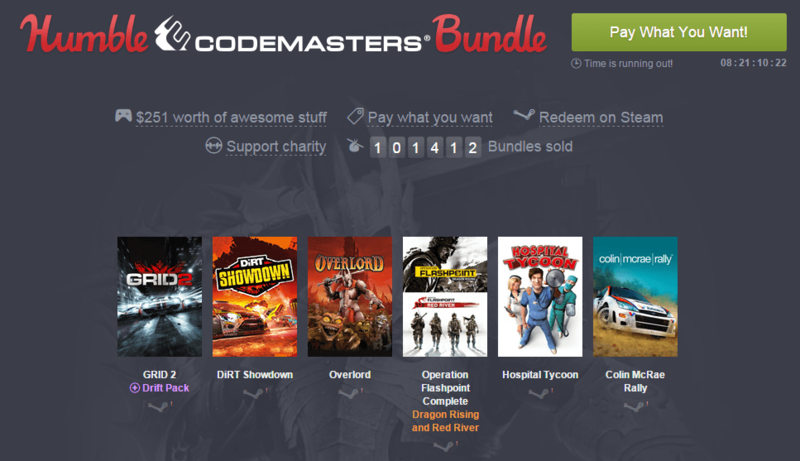 HumbleBundle.com practically gives away popular games in return for donations. I picked up Worms Armageddon, Worms Crazy Golf, and a few other Team17 titles for a little over a $1. The more you donate, the more games you get in return. As of this writing, you can also get several games by the developer “Codemasters”, such as Grid 2, Dirt Showdown, Overlord, Operation Flashpoint, Hospital Tycoon, and Colin McRae Rally for as little as $1. Even if you already own some of these games, you can give spare cd keys to your friends and family. Sometimes I’ll donate more, depending on how much spare cash I have, and I highly recommend you do as well to support their cause! HumbleBundle routinely offers various game bundles for next to nothing. Browser Plugins are another great way to save money. Did you know that you can use a special browser plugin to automatically apply coupon and promotional codes? The app is simply called “Honey” and you can add it to your browser by going to joinhoney.com. There are many times I will be making a standard purchase and I’ll instantly knock 5 or 10 bucks off of the price by just clicking on the plugin icon during checkout. The plugin will automatically search and enter promo codes for you, which makes the process really convenient. Honey works with many popular retail sites, such as Amazon, Target, GameStop, and many others. Give it a try on your favorite retail site and you might get lucky. Enhanced Steam is another great browser plugin that I came across. Once the plugin is installed and activated, you simply just go to steampowered.com and you can quickly and easily compare the best prices from every online retailer. There were many times I was getting ready to purchase a game directly through Steam’s website, only to find out there was a cheaper alternative. You can also quickly see the pricing history of specific games. If a $50 game was on sale for $30 a week before, it gives you a better idea to hold out for another sale or to look elsewhere. You can install this plugin at enhancedsteam.com. Using the plugin “Enhanced Steam” while visiting steampowered.com will allow you to easily compare prices. How do I find out about these deals and tricks? It’s really not much different than how you found this article. By visiting gaming blogs and reading through game forums such as NeoGaf, you will often find forum threads online where users will share deals with each other. I also like to visit sites that are dedicated to finding bargains, such as CheapAssGamer.com and SlickDeals.net. There are many times where a crazy bargain will be active online for only 30 minutes, such as a pricing glitch, and I will just happen to come across the forum thread at the lucky moment to take advantage of it. Finding deals can become an addiction, so try to keep in mind that you aren’t really getting a deal if you have no intention of consuming what you buy. I have often made the mistake of buying a game for a very good price only to not get around to playing it. The worst part is when you never bothered playing the game you bought and the price becomes even cheaper over time. I would highly recommend only buying games that you intend to play. Games often can drop 50% in price within a few months! If you absolutely NEED to play that one special game as soon as possible, maybe this guide will be of some help. Happy deal hunting!